Appealing to multi-media artists, textile artists, embroiderers and indeed anyone with a love of beautiful, innovative works of art, this book is a treasure trove of ideas and inspiration. It provides not only a wealth of information on materials and methods, but also twelve step-by-step projects and numerous stunning photographs of Ann's own pieces, and so contains everything you need to explore this fascinating art. Discover how to create fantastic effects on metal by heating it, treating it with bleach, vinegar and other corrosive household substances, and adding texture and colour through foiling, stamping, stencilling, embossing and more. 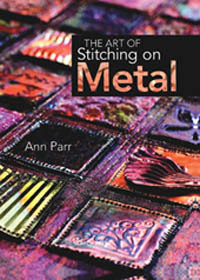 A thorough exploration of machine-stitching on metal covers everything from free-machining to decorative stitching, and the sections on woven metal strips, edgings, braids, beads, tassels, cords and a wide range of decorative finishes will not fail to fuel your enthusiasm and creativity. Finally, the twelve projects featured throughout the book will allow you to make some gorgeous items of your own, including a beautiful pewter pendant, a colourful brooch, decorative panels to adorn your home, and a fabulous metal-woven doll.